On January 20th, a burial took place at a Jewish cemetery in London that was attended by members of the government, clergy, and 1200 Jews of varying degrees of religiosity. Who was this individual whose death had brought together so many, and from such a wide spectrum of society? No one knew. In fact it was the partial remains of six people, five adults, one child, all of them Jews who had been murdered in Auschwitz. The remains, ashes and bone fragments, had been found at the Imperial War Museum among artefacts donated to them. In the process of preparing the Museum’s new Holocaust exhibit, the items had surfaced and so the ashes had been returned to the Jewish community for burial. January 20th is remembered as the day of the Wannsee Conference in which the “Final Solution” was planned. 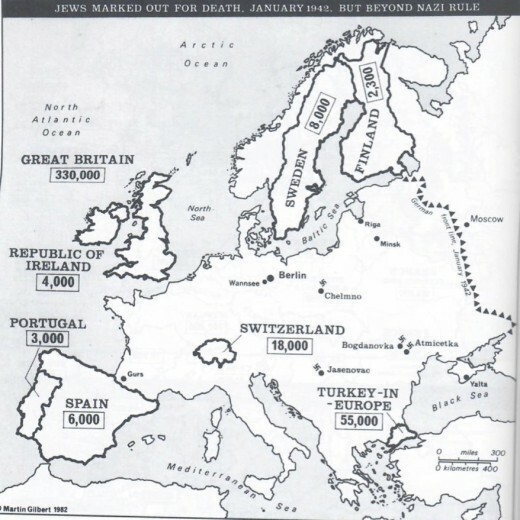 The journey the Jews buried in London had taken from their homes to the crematoria, and the millions like them who found their end in Chelmno, Belzec, Sobibor, Treblinka, Maly Trostenets or Auschwitz-Birkenau, that journey began with the Wannsee Conference on 20 January 1942. Reinhard Heydrich, the chief of the Reich Security Main Office had called the meeting; Adolf Eichmann, head of the Jewish Affairs section had organised it. Martin told me that after the meeting, when the fourteen other members of the conference retired for their brandies, Eichmann was disappointed that he not been invited to join them: he was too junior. 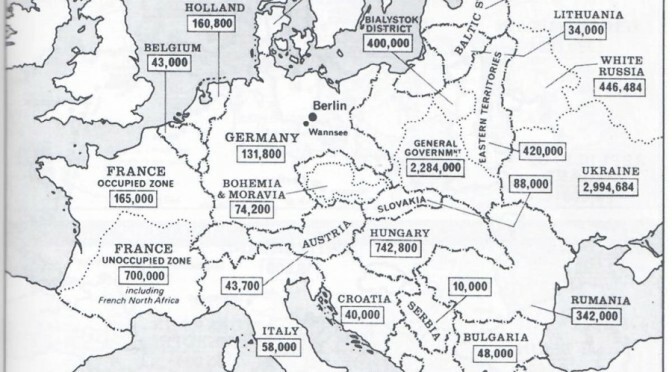 These are the government ministries who were represented there: the Ministry of Justice, the Foreign Office, the Ministry of the Interior, the Ministry for the Occupied Eastern Territories, the General Government of German-occupied Poland, the Chancellery, the Race and Resettlement Office, and the Plenipotentiary for the Four Year Plan, which was responsible for disposing of Jewish property. They joined six representatives of the SS, Hitler’s Schatstaffel “protection squad”, and in all comprised eight doctors of jurisprudence. 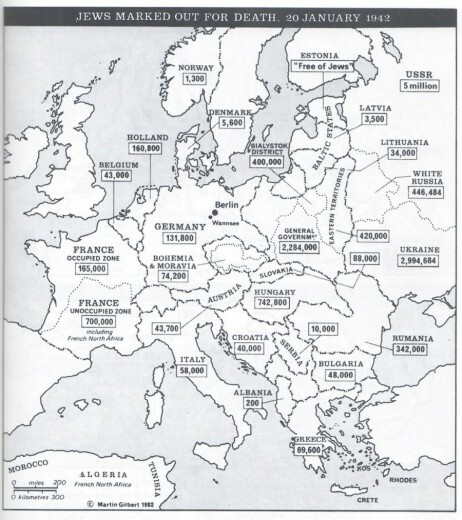 These were educated men at the top of their professions who planned the disposal of every trace of Europe’s eleven million Jews, from the west coast of Ireland right across Europe to the eastern shores of the Soviet Union, and included France’s North African holdings in Morocco, Algeria and Tunisia. They were not monsters. They were bureaucrats. They sat in a lovely villa by a lake and discussed logistics. It could have been like any business meeting anywhere in the world. But they were there to discuss methods of murder. Not one of the articles in the media that reported the burial of these ashes – at least that I have seen in the Jewish press and the regular press – not one mentioned the significance of the date. Is it that dates have become surplus to requirements in the learning of history? Is it that planned destruction is no longer connected back to the organisational meetings during which it is planned? Are we so living in the moment that we are not even aware of what came before, especially if it was decided in calm tones behind closed doors? The people whose remains were buried in London on 20 January 2019 – their fate was sealed on 20 January 1942. “Never again” involves recognition of loss, but it is also vital to remember what happened and how it happened. Our pain will not avert other genocides. But learning how they happened just might. For more information on the Wannsee Conference, please see Sir Martin’s The Holocaust, in which the Conference has a complete chapter.